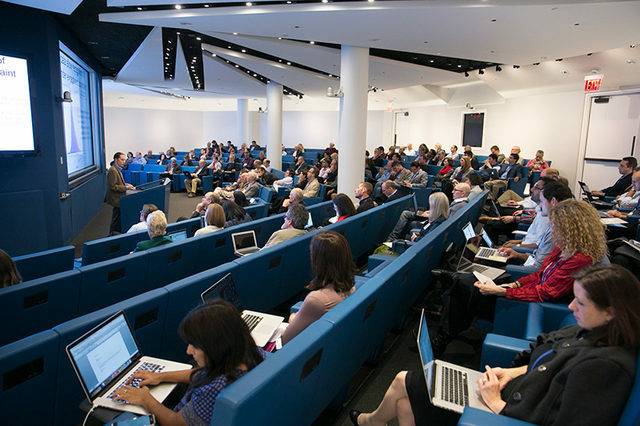 The Simons Foundation Autism Research Initiative (SFARI) held its seventh science meeting from April 12-14, gathering together more than 100 SFARI-supported autism researchers. A diverse set of topics was covered during the three-day meeting, including the genetics of autism, neural circuit dysfunction and gene-environment interactions. By bringing together leading researchers focused on different aspects of the disorder, SFARI hopes to encourage interdisciplinary collaboration and the cross-pollination of ideas that will advance our understanding of autism and build a robust sense of community among autism investigators. Helen Mayberg of Emory University delivered the meeting’s first keynote speech. Her talk provided an overview of studies by her group and others that led to the use of deep brain stimulation in individuals with treatment-resistant depression. Mayberg emphasized the need for ongoing neural-circuit-based mechanistic studies to help identify subgroups of depressed patients who might benefit from this therapeutic approach. She also discussed the implications of such findings for the development of future autism therapies. The following two days featured presentations from 20 speakers discussing both human studies and animal models of autism spectrum disorders. Just a few of the many illuminating talks included: Massachusetts General Hospital’s Mark Daly’s presentation of results from a pilot study that evaluated the use of amplified DNA, through whole-exome sequencing, from neonatal blood spots for assessing both rare and common variants and copy number variants. The overall aim of this SFARI-funded project is to combine a nationwide psychiatric registry in Denmark with genomic data from DNA extracted from blood spots collected at birth from all Danish citizens since 1981. Together, these data could potentially enable researchers to analyze more than 15,000 cases of autism. Theo Palmer of Stanford University provided compelling evidence from mouse models for interactions between genetic risk factors for autism and environmental factors that influence fetal development, such as maternal-illness-induced placental damage. James Rehg of the Georgia Institute of Technology discussed his group’s efforts to develop automated technologies that would reliably assess eye contact between a child and an adult clinician, the ultimate goal being to develop cost-effective and objective assessments of treatment outcomes in children with autism. Keynote speaker Tim Page, professor of journalism and music at the University of Southern California, addressed the group on the final evening. He shared his life experiences around being diagnosed with Asperger syndrome at the age of 45. Page began his talk by reading an excerpt from his 2009 book “Parallel Play: Growing up with undiagnosed Asperger’s,” which describes some of the challenges he faced during childhood as well as his unique gifts and deep passion for music. This was followed by a question and answer session that provided additional insight as to how he overcame obstacles associated with being on the spectrum as he established an accomplished career as a journalist, writer and music critic. His talk was a poignant reminder of how autism impacts everyday lives and helped to put a face to the disorder that was the focus of the research discussed over the previous two days. Other invited speakers included Ralph Adolphs, Ruth O’Hara and Tal Kenet (clinical studies session); Mark Bear, André Fenton and Chinfei Chen (neural circuits session); Evan Eichler, Christopher Walsh and Daniel Geschwind (genetics session); Lucy Osborne and Michael Greenberg (molecular mechanisms session); Sarkis Mazmanian (immune mechanisms session); and Ype Elgersma, Amiel Rosenkranz, James Sikela, Mark Wallace and Michael Platt (short talk sessions). SFARI science meetings, which began in 2009, have traditionally been held annually. This year, for the first time, SFARI will host two meetings (April and October). The biannual meeting format allows not only SFARI Research and Pilot Grant awardees to attend, but also Explorer Grant awardees, who receive shorter-term support for high-risk exploratory studies. More representatives from SFARI partner projects, such as Autism BrainNet, are also expected to attend. For additional information about SFARI-funded research projects, please visit: http://sfari.org/sfari-community/investigators.